Clean the pork pata. Remove all hairs by scraping the skin with a knife. Then wash thoroughly. Make four to five inch cuts on the sides of the pata. On a deep stock pot, place the pata and cover with water, soda, and salt. Bring to a boil and simmer for 20 minutes. Add the baking soda and continue to simmer for another 10 minutes. Remove the pata from the pot. You may then proceed and hang it, allowing to drip dry for 24 hours. Or you may thoroughly drain the pork pata and place in the refrigerator for a few hours. When ready to cook, rub patis (fish sauce) on the pata and sprinkle with flour liberally. Heat enough cooking oil and deep fry the pork pata until golden brown. Serve Crunchy Crispy Pata with hot rice and Atchara! 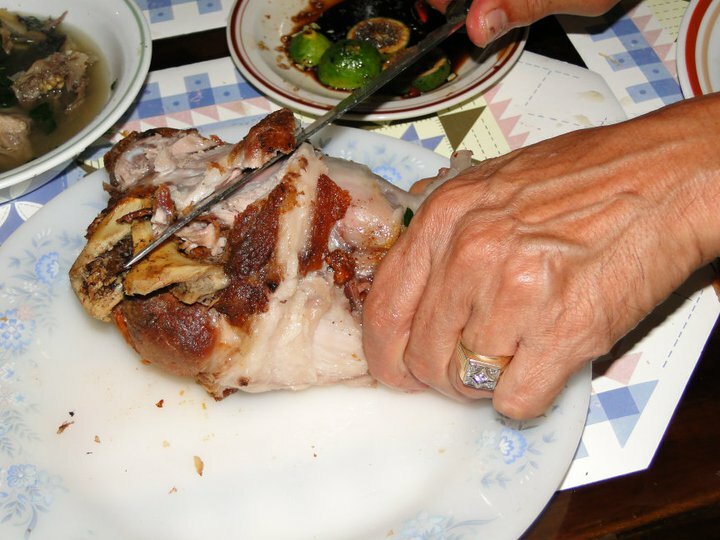 this is an easy way how to do crispy pata. but i love to eat it once in a blue moon. in other words, i’d eat rather than cook. lol.